Increased energy is possibly the biggest and best result of exercise. Allow Innovative Results, Voted Best Gym in Orange County, help you exercise and increase energy. Everyday all over the world, people say that they are tired and they wish that they had more energy. A lot of people will try several different remedies to increase their energy. whatever they feel they need to increase their energy. What most people won’t do is exercise. It is proven that exercise can and will increase someone’s energy. By working out in the morning, it can give you that spark to push you through the day and that day will end with a great night sleep (another benefit of exercise) and I am sure you know that usually when you get a good night sleep, you aren’t exhausted and tired the next day right. Increased energy can come from increased movement because the body is constantly in motion and what better way is there to keep the body moving then by exercising? This also makes everyday activities that much easier. When exercising, endorphins are released into the bloodstream resulting in more energy. You may be saying that hey, if I exercise, I will be tired and exhausted but the fatigue that is felt after a great workout isn’t the same everyday fatigue that results from being inactive. Go out and exercise so tomorrow when you wake up you won’t feel so tired, you’ll feel like working out again because it is such a great feeling. Was “The Best Gym In Orange County Helps You Exercise and Increase Energy” helpful? Leave us a comment…. Innovative Result’s has been voted the best gym in Orange County for continuous years. The team of coaches will help create a personalized program to suit your busy schedule and athletic ability. Here are 5 ways to slow aging. Practice these daily if you want to look and feel great as long as possible whatever your age. The daily stress imposed by relationships, work, and lifestyle are a major factor in aging and the development of aging conditions. The most effective antidote for reducing stress is living as much as possible in the present moment. Every day, practice meditation, t’ai chi, qi gong, and prayer. Listen to relaxation tapes designed to synchronize both hemispheres of the brain. Try to keep your mind totally focused on what you’re doing at the moment, even during the most mundane tasks. With practice, you’ll become much better at thinking less and accessing your intuition and inner wisdom, which will improve your quality of life and long-term health. Fast becoming a worldwide problem, obesity is a chronic disease that accelerates aging, helping to explain why it’s implicated in heart disease, diabetes, and cancer. Overweight stems from eating too much, eating the wrong foods, eating while stressed, and your genetic inheritance. The greatest culprit is sugar – not just table sugar but sweeteners and all “white” carbohydrates (white bread, white pasta, white potatoes). Sugar contributes to skin wrinkling, impairs immune function, and causes hormone imbalances, particularly insulin and cortisol. Reducing caloric intake is a scientifically proven way to extend longevity. Ideal body weight, age, and exercise level determine how many calories you should ingest daily. Women 25 to 50 need a daily intake of 1,800 to 2,400 calories. Men in this age group can eat between 2,200 and 2,600 calories. Anyone over the age of 50 needs to limit calories to somewhere between 1,500 to 2,200 a day. Convenient for most people even during the middle of the workday, walking is an excellent way to improve cardiovascular function. Swimming, cycling, running, and other aerobic activities prime the body to release growth hormone and testosterone, which is converted into estrogen in women. Aerobic exercise also reduces insulin and corticol levels, while releasing the “feel good” neurotransmitters that elevate mood and improve sleep. Always begin your exercise session by deep breathing for several minutes. Warm up with mild aerobics for five minutes; then complete 20 to 30 minutes of more vigorous aerobic exercise to begin raising hormone levels. Follow aerobics with no more than 40 – 45 minutes of heavy lifting (anabolic or resistance) exercises. Heavy lifting for longer periods of time can actually sabotage your efforts. That’s because body toning and muscle building hormones begin declining rapidly and cortisol starts kicking in. Aging occurs because stress, poor diet, and the lack of regular exercise increase the production of free radicals – rogue molecules that damage DNA, proteins, and fat membranes. When we’re young, the body’s internal defenses may be sufficient to block free radical damage with antioxidants and detoxifying enzymes in the diet. But as we grow older, or when we’re under great stress, these internal defensive mechanisms grow less effective, and we need supplements to bolster protection against free radical activity. Common antioxidants include vitamins A, C, E, plus alpha and beta carotene. The amino acid cysteine, the B vitamin niacin, and the minerals selenium, zinc, copper, and manganese are essential components of detoxifying enzymes. All the previous steps help counter skin and body aging. In addition, topical creams can protect the skin from UV radiation and help heal redness, scarring and wrinkles. Alpha lipoic acid is very effective when applied topically. Also effective topically in its estrified form (ascorbyl palmitate) vitamin C is necessary for repairing collagen and elastin. Green tea and Pycnogenol™ are excellent anti-inflammatory agents. Zinc, niacin, and other topical ingredients help repair the DNA in skin cells, so that healthy new tissue grows to replace wrinkled and sagging skin. Was 5 ways to slow aging helpful? Leave us a comment…. Innovative Result’s Coaches in Health and Fitness Orange County can help you look and feel better. We know exercise is good for us, but did you know you will sleep better with exercise? We’ve been told time and time again that it can help prevent weight gain and keep us healthy. But so many barriers exist to prevent us from exercising, especially if we are caregivers. As a caregiver, you may have less time than any of your friends, neighbors, coworkers, or family members. Each minute of your day may be carefully scheduled. You may find yourself with piles of bills to pay, people to call, prescriptions to pick up, and extra work at night and on the weekends. You may have knee, hip, ankle, or other joint or bone conditions that prevent weigh-bearing exercises such as Aerobics or running. You may have other health conditions that prevent you from getting your heart rate up too quickly, or too high. And, quite frankly, you may not have the energy to exercise. Any “spare time” you discover may best be spent taking a nap, cooking a nutritious meal, or even relaxing on the couch with a book. It seems counter-intuitive to spend precious energy on exercise. Did you know, however, that even walking one mile a day can help you sleep more soundly, and fall asleep faster? According to one study, regular exercise may promote relaxation and raise core body temperature in ways that are beneficial to initiating and maintaining sleep. We all sleep better with exercise. The American Heart Association recommends that individuals perform moderately-intense exercise for 30 minutes most days of the week. This recommendation is similar to those supported by both the Centers for Disease Control and Prevention and the American College of Sports Medicine. The good thing is you can add up those 30 minutes over the course of one day. As a caregiver, you may never have an entire half hour all at once to devote to exercise. However, you might be able to find 10 minutes after lunch for a walk around the office, or 5 minutes in between TV commercials for some leg lifts. Even vacuuming and cleaning the house has benefits. You may feel too exhausted each day to even think about exercise, but you have to expend energy to get energy. Staying active and incorporating as much movement into your day as possible will help you stay healthy. Was this helpful? Leave us a comment…. Innovative Results has been recognized as the most trusted personal trainer in Irvine CA. Their unique fitness programs help people all around Orange County look better, feel better and perform at their best. I do crunches everyday! Where are my abs? If I do a crunch everyday, will I have abs? If I do crunches everyday, will I have a six pack? Is a crunch a good ab exercise? What exercises should I do to have abs or a six pack? 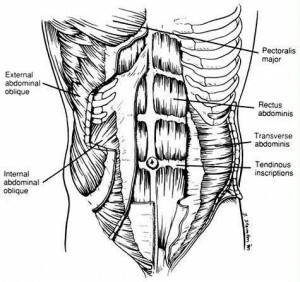 Without question, the single most important factor in the appearance of your mid-section is the amount of fat and fluid between your abdominal muscles and your skin. You have a 6-pack right now its the natural shape of your muscles. But for most of us the layer of fat over our abs is so thick that you cannot see them. 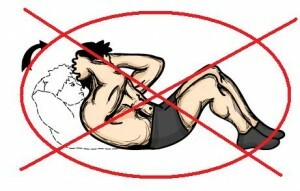 Trying to burn fat with a crunch or sit-up is like trying to dig to China with a spoon its a complete waste of time. There is no such thing as spot reduction. You will need to do more than just crunches and sit-ups. Just because you work on your ab muscles doesn’t mean that you will affect the speed at which you lose fat in that area. Fat loss is a lot like scooping water from a bath tub. If you take a cup of water out of the middle of the tub, it doesn’t leave you with a one cup dent in the middle of the tub. It leaves you with a cup less water all over. If you lose a pound of fat, you lose it from your entire body, regardless of how many crunches you do. This didn’t happen with crunches. This will help you burn as much fat as you can each day. If you get your body fat percentage low enough, you will see your beautiful abs even if you don’t do a single crunch. A very nice looking midsection, for a man, start showing up at around 12% body fat. For women, it starts at about 18-20% because men store all of their fat on their belly, and women put it on their hips and thighs. Not a crunch or sit-up here, just weight lifting and diet. Excessive toxins from conventional plant and animal foods (and alcohol) overload your liver and encourage extra fat to form around your midsection, whether you are a man or a woman. The more toxic and/or dehydrated you are, the thicker the layer of fluid becomes, making you appear more chubby. So, eating organic, grass fed, and free range foods will greatly affect the results of your program. This body shaped by hard work, discipline, and nutrition. So here are some guidelines that have worked wonders for our clients!! 1. Eat every 2-3 hours or 5-7 meals/snacks a day. 2. Yes, you will probably need to eat more often to lose fat for life! 3. Serving size: listen to your body. If you are hungry 30 min. later, you didn’t eat enough. If you feel sleepy, you ate too much. If you feel great, you got it right! Live in Orange County? Schedule Your Free Trial by filling out the form below. Reliance on endurance activities (cardio) to burn calories and fat is like using a shot glass to fill up a pool. It is possibly the least efficient way to lose body fat! Cardio focuses only on increasing the amount of fat that you are burning during the time that you are active. So, if you do 60 minutes on the elliptical machine, you have increased your metabolism only for that 60 minute session. If you are doing cardio seven days a week (1 hour per session), then you are spending only approximately 4% of your week burning extra fat. Another problem with this approach is that once you pass the 45-60 minute mark in your cardio session, you have depleted your body’s glycogen stores, and your body will now begin to use protein to fuel your energy needs. Unfortunately, your body gets that protein from your muscle tissue, meaning that the extra time that you spend doing cardio is actually shrinking your fat burning furnace, muscle mass. Keep this up for long enough and you will actually slow down your metabolism and burn less fat. This makes the other 96% of your week, when your burn the vast majority of your calories, much less effective. The solution: Do resistance training circuits. Resistance training basically refers to higher intensity activities. For example, you could walk for 5-6 hours without too many problems, but you could not squat for 5-6 minutes. It takes far more energy to do one squat than to take one step. Squats, lunges, bends, twists, pushes and pulls against resistance would all classify as resistance activities. Circuit training is when you sequence several activities one after another. It generally consists of up to 8 exercises in a row. For example, doing a lunge and twist, followed immediately by a squat, push ups, pull ups, and jumping rope would be a good circuit. The advantages of a circuit are that you get all the benefits of resistance training, along with all of the benefits of cardiovascular activity. You get the best of both worlds! *6-15 hour metabolic boost after workouts. *24-48 hours of increased calorie/fat-burning activity. *24 hours per day 365 days per year your metabolism will be faster and burn more fat! **Ladies: 5 lbs. of muscle will fit in the space of 2.5 lbs. pounds of fat. So, if you gain muscle and lose fat, you will be significantly smaller and firmer. We are not saying that cardio is bad for you. We are saying that circuit training is a much more efficient way to lose fat. Cardio offers the smallest return on the time invested. Circuit training takes the relatively small amount of time that you have to exercise, and makes you burn more fat during the rest of your day and week. Would you rather invest 7 hours a week, get seven hours of benefit or would you want to invest that same 7 hours and get 138 hours of fat burning benefit? Was this article, “Is ‘Cardio’ the Best Way to Lose Fat? Costa Mesa Personal Trainers Don’t Think So…” helpful? Leave us a comment, and share this article with your family, friends, and coworkers. Innovative Results personal trainers in Costa Mesa provide fitness plans that help people become more active and more energetic, delivering the best way to lose fat. Their fitness programs have been voted #1 in Orange County and they continue to be involved in the local community. If you are interested in learning more about their program or having them help you get in shape, dill out the form below.